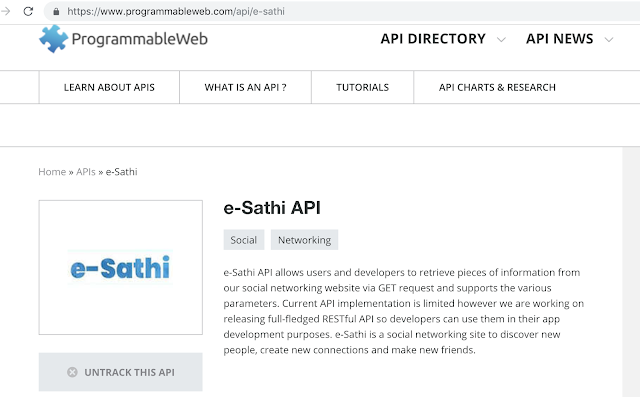 It is our pleasure to announce that the first initial version of e-Sathi API is now officially published in ProgrammableWeb. e-Sathi API allows users and developers to retrieve pieces of information from our social networking website via GET request and supports the various parameters. Current API implementation is limited however we are working on releasing full-fledged RESTful API so developers can use them in their app development purposes. e-Sathi is a social networking site to discover new people, create new connections and make new friends. 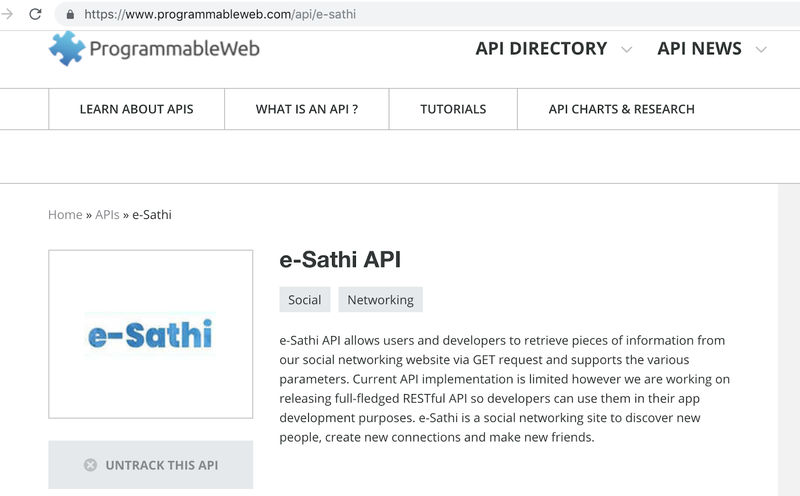 This email is to notify you that an API that you recently submitted e-Sathi has been approved for publication in ProgrammableWeb's API directory. Thank you again for thinking of ProgrammableWeb.com as a great destination for improving the discoverability of your technology! Developers love Software Development Kits (SDKs). 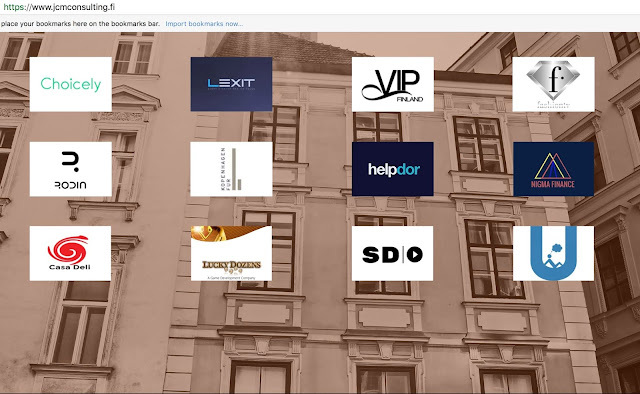 If you have SDKs, be sure to list them in our SDK directory. If you don't have SDKs, what are you waiting for? Like we said, developers LOVE SDKs. Submit a tutorial for publication on ProgrammableWeb on how to use your API, SDK, etc. Many API providers are starting to take advantage of this option. Submit summaries and links to code samples that you may have already published in your developer portal or elsewhere on the Web. Submit some other form of contributed content such as a thought leadership piece. Raise the visibility of your listings in our search results through a promoted/prioritized listing..
Use advertisements to drive more visitors to your directory listings. Take advantage of our sponsored content program to drive your brand's awareness with ProgrammableWeb's audience. Be sure to read ProgrammableWeb's guidelines to learn about all the different ways you can contribute your content to our website and what to do next when you're ready to make such a contribution. For more information on these and other options for engaging with the ProgrammableWeb community or if you have questions about your submission, please contact us at editor@programmableweb.com. e-Sathi API is part of e-Sathi.com powered by Unelma Platforms. ProgrammableWeb is an information and news source about the Web as a programmable platform. It is a subsidiary of MuleSoft and has offices in San Francisco, CA. The website publishes a repository of web APIs, mashups, and applications, and has documented over 12,000 open web APIs and thousands of applications.